Afraid of Dogs? Hypnosis can help! Hypnosis can erase years or even a lifelong fear of anything, including a fear of dogs. It is not uncommon for people who have never been around dogs to be fearful of them. Dogs have been known to attack people, especially certain breeds. But the reality is that most dogs are not likely to hurt anyone. Hypnosis can create within the mind a new reality from your present thoughts about what dogs can and will do. You’ve probably heard the expression, “His bark is worse than his bite.” This refers to the fact that most dogs will bark, and even sound vicious but that they will not actually bite. The barking is simply the dog’s way of communicating. While it is good common sense to be cautious around dogs you do not know, most dogs are approachable and just want to check you out and get to know you. This sniffing around and hesitancy on the dog’s part, is also triggered by the sense the dog gets from you. If you can portray a feeling that you are not afraid of the dog, the dog will warm up quickly to you. Hypnosis works to overcome the fear of dogs by removing irrational thoughts about dogs and replacing them with realistic ones. It also helps you to relax and remove your anxieties as they relate to dogs so that the message you give the dog is as friendly as what they will give you in return. A slow approach to changing your attitudes and behaviors toward dogs, will allow you to approach them with confidence. It can be important to overcome a fear of dogs for many reasons and hypnosis can help. If you are in a relationship with a dog owner, often visit people’s homes for work or recreation, or if you would just like to be able to take a leisurely walk around the block without worrying about running into a dog, then hypnosis will help you feel more comfortable around dogs. 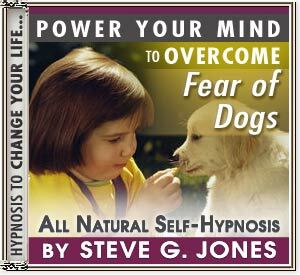 Clinical Hypnotherapist, Dr. Steve G. Jones M.Ed., leads you through the process in his CD, Overcome Fear of Dogs. Overcome fear of dogs quickly and easily with hypnosis! We all know that dogs should be respected but an undue fear of dogs can really get in the way. A strong fear - or phobia - of dogs can make the most pleasant walk fraught with anxiety. Hearing a dog bark can cause immediate panic and a powerful urge run away. Of course, many dogs will take this as an invitation to play and chase you, which will make the situation even worse. It may be that you developed a fear of dogs through a past experience with dogs. Maybe one particular one scared you and now your unconscious mind has come to associate all dogs with threat and fear. On the other hand, you may have no idea why you are scared of dogs - one particularly phobic client got their phobia from watching a news report about a dog attack when they were young. My Overcome Fear of Dogs hypnosis CD or Overcome Fear of Dogs hypnosis MP3 will gently allow your unconscious mind to learn a new way of responding to dogs, giving you the choice back about how to respond. The vast majority of dogs are safe and even friendly. And when you are relaxed around dogs you’ll instinctively know how to handle them better. This Overcome Fear of Dogs hypnotherapy CD or Overcome Fear of Dogs hypnotherapy MP3 will allow you to feel natural and to relax around dogs and dogs will pick up that you are relaxed and comfortable. You will be able to spot an aggressive dog much more easily because your senses are not swamped by anxiety. Overcoming a phobia of dogs affects your life in all sorts of ways. Past experiences around dogs will no longer dictate current reactions to them. FINALLY overcome your fear of dogs!! !